If you’re of the opinion that Spider-Man has been rebooted too many times in the last two decades, hold onto your hats: the animated adventure “Spider-Man: Into the Spider-Verse” introduces no less than seven new versions of the character within a single film. 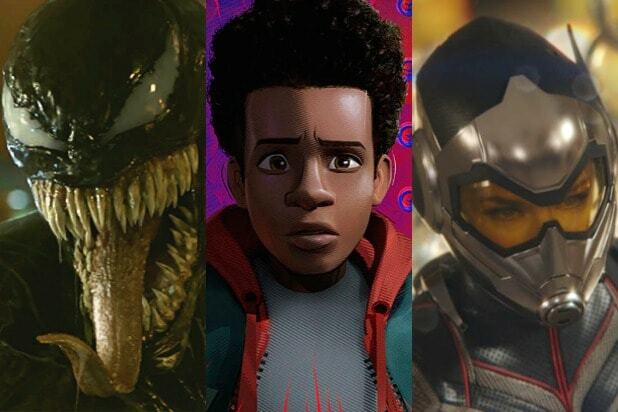 “Spider-Man: Into the Spider-Verse” stars Shameik Moore (“Dope”) as Miles Morales, a half-black, half-Latino teenager torn between his overbearing yet good-natured police officer father Jefferson (Brian Tyree Henry) and his more relaxed, sketchier uncle Aaron (Mahershala Ali). While Miles practices his graffiti art with his uncle, he’s bitten by a radioactive spider, and we all know what that means. The problem isn’t just that Miles starts sticking to his fellow classmates, or that his inner monologue gets louder (one of the film’s most satisfying jokes). The problem is that he stumbles across Spider-Man (Jake Johnson) fighting Kingpin (Liev Schreiber), in the middle of a giant interdimensional rift device. Miles watches helplessly as Spider-Man dies, and he promises to finish what the hero started, namely to prevent the Kingpin from using the machine again, lest it destroy the world. While he’s wallowing in guilt and self-doubt, Miles stumbles across yet another Peter Parker/Spider-Man (Johnson, again)… and a Spider-Gwen (Hailee Steinfeld) … and a Spider-Noir (Nicolas Cage)… and a Spider-Ham (John Mulaney)… and a SP//dr (Kimiko Glenn, “Orange is the New Black”). Spider-Persons from throughout the multiverse have been sucked into Miles’s reality because of Kingpin’s machine, and they need to stop him and return to their own time periods before they blink out of existence. The plot seems like it should be too much for one film to handle, but “Into the Spider-Verse” wisely stays focused on Miles and his story, and uses all the other characters for support. Miles Morales is an incredibly captivating new hero, in a story that challenges him in every conceivable way. His powers force upon him an awkward physicality that robs him of his previous confidence. His oath to save the world is such a heavy weight around his shoulders that he always looks ready to collapse. And his loyalties to his family are strained past the breaking point, in a subplot that has the sort of dramatic heft we haven’t seen in a superhero film in a very, very long time. That heft is shared by several other Spider-heroes, and it’s impressive how organic the presence of such wildly different interpretations of the characters comes across. 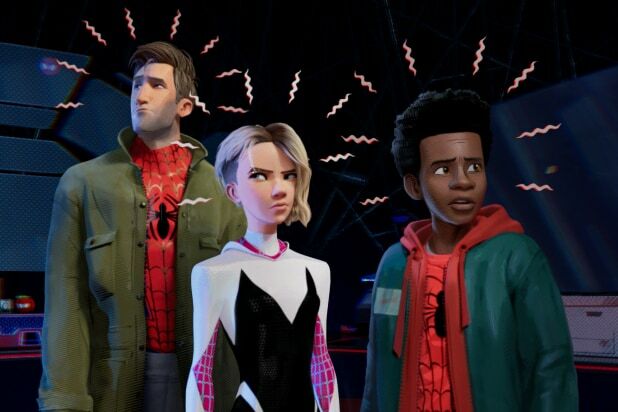 Miles, Peter and Gwen take up most of the screen time, leaving Spider-Ham, Spider-Noir and SP//dr to add levity and unusual action beats to the film’s second half. It’s also satisfying to see a superhero film offer this much representation across the board (even though the recurring fat jokes are bound to leave some audience members feeling like they’re still not allowed in the club). “Spider-Man: Into the Spider-Verse” understands all too well that the appeal of Spider-Man, in any form, isn’t just the hero’s powers, and it isn’t just the hero’s tragic backstory. It’s the unmistakable sense that the universe has it out for this person, and he or she is going to persevere anyway, through good humor and good intentions. Miles and Peter seem permanently trapped in violent Harold Lloyd routines, getting hit by cars, falling off buildings, dragged by trains, and hiding their identities behind flimsy excuses. But as hilarious as “Into the Spider-Verse” is (and it’s easily the funniest Spider-Man movie ever), the film also evokes a greater sense of tragedy than any film in the series since Sam Raimi’s original. The heroes are elastic, but life is fragile, and death is very real. If you include flashbacks, the film has a rather impressive body count. What’s more, each of these deaths still motivates the characters left alive, so mortality is always at the forefront of our thoughts, even when the heroes are effortlessly throwing cars around inside a swirling knick-knack vortex of death. What’s more, the film’s sprawling cast legitimizes every single version of every single superhero, to audiences who may still wonder why we need yet another “Spider-Man.” Or yet another “Fantastic Four.” Or yet another anything. The realization of each hero that they aren’t alone, and that someone understands their pain, can be shared by every audience member recognizing someone just like them on the big screen. They share similar origins, but they connect with different fans, who each have different ideas about the character and what they represent. And each of those versions of Spider-Man, or any other hero, deserves at least a modicum of appreciation, even if they’re not “our” version of the character. “Spider-Man: Into the Spider-Verse” represents some of the best superhero storytelling on the market. The frenetic animation and freewheeling story offer audiences a sense of boundless dynamism. It’s not the first time a director has attempted to incorporate comic book iconography into a feature-film adaptation — see also: Ang Lee’s “Hulk” and Edgar Wright’s “Scott Pilgrim vs. The World” — but it’s the most appealing. Watching “Into the Spider-Verse” evokes feelings of sitting cross-legged on the floor of your bedroom, eating cookies and immersing yourself in outrageous, mostly inviting new worlds.